Small, easily transportable spaces have been realised by a generation of new architects. They are unconventional cellular spaces designed to be mounted on or docked with existing houses, as suspended or standalone units. They form a category distinct from campervans and caravans, which remain within the domain of automotive design. 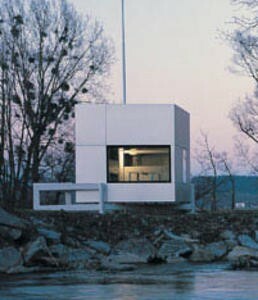 The Micro Compact Home, designed by the English architect John Hoepfner, however, does a wonderful job of straddling the dividing lines between the disciplines of town planning, architecture and car design. The cuboid home with an overall length of 2.66 metres in not intended for modern nomads but primarily for use on temporarily available sites for the likes of students. The cubes consist of a wood sandwich construction with an aluminium/PVC outer skin and an inner cladding of PVC. They are gently staggered along a slightly raised pathway offering a degree of collective cohesion to counterbalance their individuality.